One of the most important publications of the Cleveland Artists Foundation is Yet Still We Rise: African American Art in Cleveland 1920-1970. The 1996 exhibition opened at the Cleveland State University Art Gallery and then traveled to the Butler Institute of American Art in Youngstown and the Riffe Gallery in Columbus. The exhibition catalogue discusses African American art in Cleveland and provides national context. It also includes brief (usually about a page) biographies of most of the artists included in the show. The artists covered include Edith Brown, Elmer W. Brown, James T. Brown, Malcolm W. Brown, George Bryant, Fred Carlo, Lewis and Andrew Chesnutt, Allen E. Cole, William W. Crawford, Matthew Dunlop, James "Jimmy" Gayle, Harold Louis Golden, Charles Elmer Harris (a.k.a. Beni E. Kosh), Josephus Hicks, Charles Ingram, Zell (Rozelle) Ingram, Hughie Lee-Smith, Virgie Paton-Ezelle, Clarence Perkins, Douglas Phillips, Charles Jackson Pinkney, Charles Louis Sallée, William E. Smith, Ernest William Trotter, Henry Williamson, and W. Hall Workman. 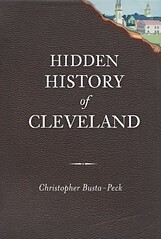 The book, quite simply, is the best source on African American art in Cleveland. WorldCat lists 59 library systems as owning copies of the book - more than twice as many as the next most popular Cleveland Artists Foundation publication. The 1996 catalog has long been out of print. The asking price for Yet Still We Rise has climbed such - now usually $50-150 - that I've considered selling my own copy. The copy listed on Amazon.com right now at $11 is an outlier and a great deal. Why do I make a point of the rarity of the title? As part of the 2009 exhibition Each in Their Own Voice: African-American Artists in Cleveland, 1970-2005, the catalogue for Yet Still We Rise: African American Art in Cleveland 1920-1970 was scanned and made available. The 165mb PDF may be downloaded from the Cleveland State University Art Gallery website. The Cleveland Memory Project features interviews of some of the artists involved in Each in Their Own Voice as well as photographs of some of the artworks.